Pure Gold Jewellers, an award-winning jewellery retailer, has opened seven new concept stores in the UAE, Kuwait and Oman. The new stores are located in the UAE at Al Ain Mall, World Trade Centre and Yas Mall in Abu Dhabi, Sahara Centre and Central Souk in Sharjah, City Centre Ajman, the new Al Kout Mall in Kuwait and City Centre Sur in Oman, adding to the existing portfolio of Pure Gold Jewellers 150 stores in the Middle East and Asia. Karim Merchant, Group CEO & managing director of Pure Gold Group, said: “We continue to invest in the future of the region’s gold and jewellery business believing that an upward trend is inevitable in the economic cycle even though worldwide jewellery demand in the first three months of 2018 fell by one per cent from the first quarter of 2017 according to the World Gold Council. Designed by one of London and Dubai’s most prestigious luxury design consultancy, the stunning new stores feature a modern, stylish and minimalist boutique concept. The store elements and branding has been mastered to look drastically different from the ‘traditional jewellery store’ layout, a company statement said. The store space focuses on a curated selection of products ranging from unparalleled premium diamond collections to intricately designed 18-karat and 21-karat handcrafted Italian gold jewellery in trendy, fashion-forward and elegant classic designs. 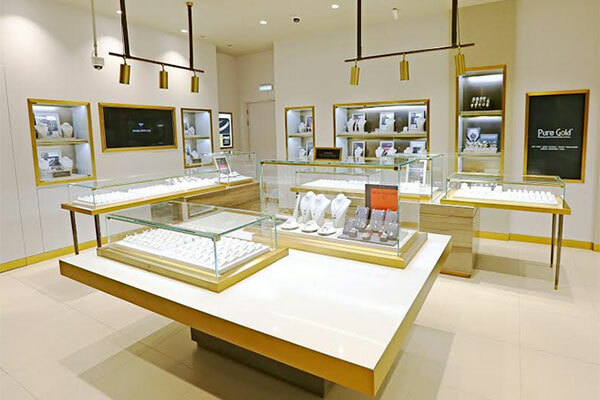 The stores are also equipped with experiential tables allowing customers, especially millennials to interact and engage with jewellery with the help of augmented reality, further elevating their shopping experience.